George Orwell 1984: Sales up 5,000 percent on Amazon. 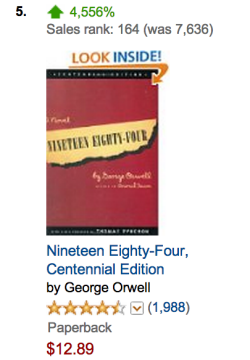 Amazon is watching us buy copies of 1984. Sales of one particular edition of George Orwell’s dystopian classic are up some 5,000 percent on Amazon.com in the past 24 hours, according to the site’s list of “movers and shakers.” The figure was as high as 7,000 earlier today. It would be gratifying to think that millions of Americans are spontaneously flocking to the book to help them make sense of the recent revelations about the NSA’s wide-ranging digital surveillance programs. No doubt a few are. But before you conclude that this sales spike represents some sort of national intellectual awakening, keep in mind that we’re talking percentages here. This particular edition of the book might only sell a few copies in an average day, so a sudden appeal to a few thousand buyers could account for a drastic jump. And in fact, there is at least one concerted activist campaign asking people to buy the book and send it to their representatives in Washington. Other editions have seen more modest sales gains, on the order of 200 to 300 percent. None has yet cracked Amazon’s top 50, which remains the rarefied realm of titles like Glenn Beck’s The Eye of Moloch and Jorge Cruise’s timeless The 100: Count ONLY Sugar Calories and Lose Up to 18 Lbs. in 2 Weeks.